. As 2012 dawns upon us, let us take a moment to reflect on the past year. We started 2011 with a bang! In January we released a cloud-based Debugger into Apps Script’s IDE that proved to be very useful for developers. The Script Editor was upgraded bringing about many features and bug fixes. In March we implemented a very powerful feature of embedding Apps Script in Google Sites pages as Gadgets, making it easy to enhance Sites in amazing ways. 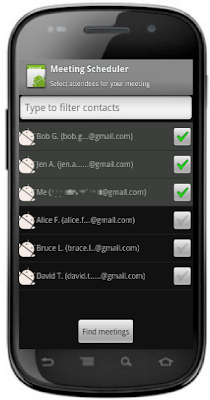 We also improved Contacts Services, making it more stable with an improved API. At Google I/O in May we launched Document Services, Gmail Services and the drag ‘n’ drop GUI Builder. These were major steps forward in making sure that Apps Script provides a full set of APIs to allow developers to build rich workflow and automation solutions. We were very busy during the summer months preparing for a series of launch for later part of 2011. In September, we launched Charts Services. 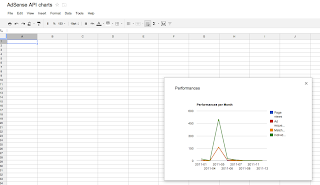 It allows users to dynamically create Charts and embed them in emails, UiApp or export as images. We also released three Google API services for Prediction, UrlShortener and Tasks APIs. Lock and Cache Services launched in October. These services are important for building performant and scalable applications. We also improved the Script Editor by adding Project Support and made other UI improvements. November brought about the launch of Client Handlers and Validators. This is only the beginning of our commitment to allow developers to build more advanced UI using Apps Script. In December we continued to improve the reliability and stability of Apps Script runtime. We capped the year by releasing Groups and Domain Services. And who can forget the very useful AdSense Services for AdSense advertisers! Throughout the year we expanded our outreach channels. There were Apps Script sessions at Google I/O and Bootcamp, and several attendees got their last minute tickets through the Apps Script I/O challenge. We were at Google Developer Day and DevFest events, met with GTUGs, and hosted hackathons throughout the world. Our blog also featured scripts like Revevol’s Trainer Finder, Corey’s Gmail Snooze, Dave’s Flubaroo, Top Contributor’s Mail Merge, Saqib’s Idea Bank, and Drew’s Calorie Counting that showed the power of Apps Script. Recently we started Office Hours in G+ hangout. These hangouts proved to be very popular, personal and effective means to share ideas with Apps Script community. Join us some day! In our efforts to help educators, we worked with a New York city school to help them make most out of Google Apps. We also hosted many EDU focused webinars and workshops. In great Google tradition, Apps Script team participated in CAPE and Google Serve. 2012 is going to be an even more exciting and promising year. Tighten your seat belts because we intend to keep firing on all cylinders! 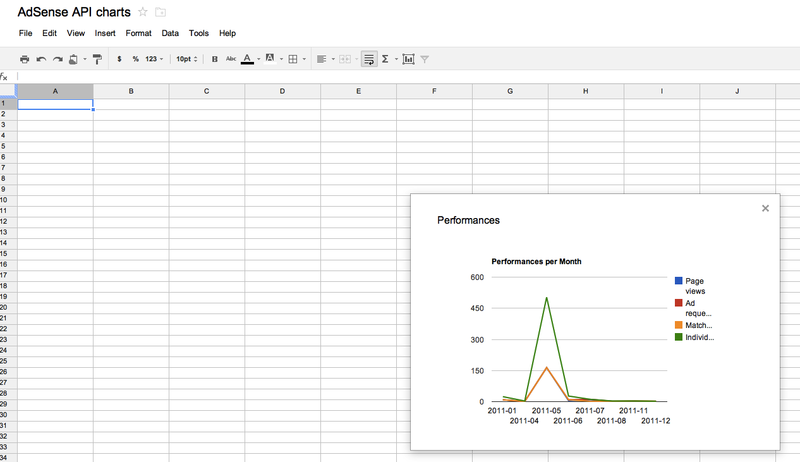 2011 was the year of momentum for Google Apps Script. As 2012 dawns upon us, let us take a moment to reflect on the past year. Let’s have a look at how you can make authorized calls to the Groups Settings API from your client application. You must enable the Provisioning API to make requests to the Groups Settings API. 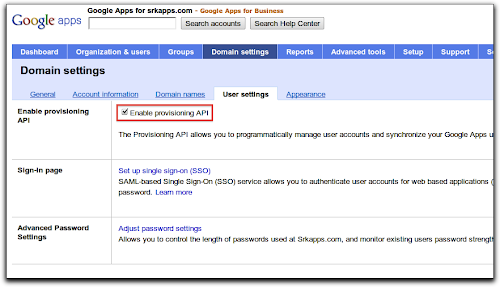 You can do so by enabling the Provisioning API checkbox in the Domain settings tab of your Google Apps control panel. Next, ensure that the Google Groups for Business and Email services are added to your domain by going to the Dashboard. If these services are not listed, add them by going to Add more services link next to the Service settings heading. Now you are set to write client applications. Let's discuss the steps to write an application using the Python client library. You need to install the google-api-python-client library first. You can register a new project or use an existing one from the APIs console to obtain credentials to use in your application. The credentials (client_id, client_secret) are used to obtain OAuth tokens for authorization of the API requests. The Groups Settings API supports various authorization mechanisms, including OAuth 2.0. Please see the wiki for more information on using the library’s support for OAuth 2.0 to create a httplib2.Http object. This object is used by the Groups Settings service to make authorized requests. The Python client library uses the Discovery API to build the Groups Settings service from discovery. The method build is defined in the library and can be imported to build the service. The service can then access resources (‘groups’ in this case) and perform actions on them using methods defined in the discovery metadata. The following example shows how to retrieve the properties for the group staff@example.com. Additional valid values for these properties, as well as the complete list of properties, are documented in the reference guide. We have recently added a sample in the Python client library that you can refer to when developing your own application. We would be glad to hear your feedback or any queries you have on the forum. When using any of the Google Data APIs in your application, you can reduce the amount of data to be transferred by requesting gzip-encoded responses. On average, the size of a page of users returned by the Provisioning API (100 accounts) is about 100 Kb, while the same data, gzip-encoded, is about 5 Kb -- 20 times smaller! When you can reduce data sizes at this dramatic scale, the benefits of compression will often outweigh any costs in client-side processing for decompression. For any questions, please get in touch with us in the respective forum for the API you’re using. All developers agree that saving bandwidth is a critical factor for the success of a mobile application. Less data usage means faster response times and also lower costs for the users as the vast majority of mobile data plans are limited or billed on a per-usage basis. was released, they have been one of the most loved features of the Google home page. There have been doodles to celebrate all kinds of events, including national holidays, birthdays of artists and scientists, sports competitions, scientific discoveries and even video games! Also, doodles have evolved from simple static images to complex applications, such as the interactive electric guitar used to celebrate the birthday of Les Paul. Want your company logo to change for selected events or holidays, just like doodles? The Admin Settings API allows domain administrators to write scripts to programmatically change the logo of their Google Apps domain, and Google App Engine offers the ability to configure regularly scheduled tasks, so that those scripts can run automatically every day. The script uses a set of predefined doodles which can be edited to match your list of images or replaced with more sophisticated logic, such as using the Google Calendar API to get the list of holidays in your country. Every time the script is triggered by an incoming HTTP request, it will check whether a doodle for the date is available and, if there is one, update the domain logo using the Admin Settings API. Once the application is deployed on App Engine, it will run the script on a daily basis and update the logo. The holiday season is upon us. Could there be a better time for your company to start using doodles? Since 1998, when the first doodle was released, they have been one of the most loved features of the Google home page. There have been doodles to celebrate all kinds of events, including national holidays, birthdays of artists and scientists, sports competitions, scientific discoveries and even video games! Also, doodles have evolved from simple static images to complex applications, such as the interactive electric guitar used to celebrate the birthday of Les Paul. in Google Apps Script. Groups Service will allow a script to check if a user belongs to a certain group, or to enumerate the members of a particular group. The Google Groups Service works with groups created through the Google Groups web interface as well as groups created by enterprise customers with their own domain using the control panel and the Google Apps Provisioning API. This opens a wide range of possibilities, such as allowing a script with Ui Services to show additional buttons to the members of a particular group - for example teachers or managers - and sending customized emails to all the members of a group. Here are a few sample scripts to help you get started with the new API. To try out these samples, select Create > New Spreadsheet and then Tools > Script Editor from the menu. You can then copy the code into the script editor. The scripts’ output will appear back in the spreadsheet. The Groups Services can be used to fetch a list of the Google Groups of which you’re a member. Below is a function which returns all the groups of which you’re a member. Copy and paste it into the script editor and run it. The editor will prompt you to grant READ access to the Google Groups Service before the script can run successfully. If you receive a message stating that you’re not a member of any group, open up Google Groups and join any of the thousands of groups there. Brendan plays trumpet in a band. He also runs the band’s website and updates its Google+ page. He’s created a web application with Google Apps Script and now he wants to add to it some additional features for members of the band. Being a model Google user, he’s already subscribed each band member to a Google Group. Although building a complete UI with Google Apps Script is beyond the scope of this article, Brendan could adapt the following function to help make additional features available only to members of that Google Group. Of course, this is not just useful for tech-savvy trumpet players: schools may wish to make certain features available just to teachers or others just to students; businesses may need to offer certain functionality to people managers or simply to show on a page or in a UI operations of interest to those in a particular department. 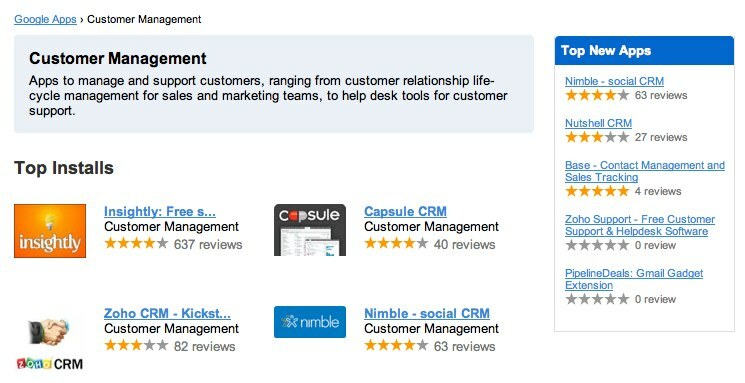 Before running this example yourself, replace test@example.com with the email address of any group of which you’re a member. Note: the group’s member list must be visible to the user running the script. Generally, this means you must yourself be a member of a group to successfully test if another user is a member of that same group. Additionally, group owners and managers can restrict member list access to group owners and managers. For such groups, you must be an owner or manager of the group to query membership. Sending an email to the group’s email address forwards that message to all the members of the group. Specifically, that message is forwarded to all those members who subscribe by email. Indeed, for many users, discussion over email is the principal feature of Google Groups. Suppose, however, that you want to send a customised message to those same people. Provided you have permission to view a group’s member list, the Google Groups Service can be used to fetch the usernames of all the members of a group. The following script demonstrates how to fetch this list and then send an email to each member. Before running this script, consider if you actually want to send a very silly message to all the members of the group. It may be advisable just to examine how the script works! The Google Groups Service lets you query a user’s role within a group. 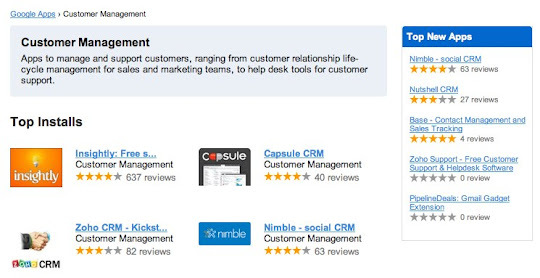 One possible role is MANAGER (the other roles are described in detail in the Google Groups Service’s documentation): these users can perform administrative tasks on the group, such as renaming the group and accepting membership requests. Any user’s Role can be queried with the help of the Group class’ getRole() method. Let us know what you end up building, or if you have any questions about this new functionality, by posting in the Apps Script forum. Trevor is a software engineer at Google. Before joining the Google Apps Script team in New York, he developed travel products in Switzerland and supported Google’s help centers in Dublin. 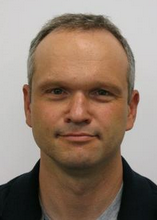 Prior to joining Google, he worked on Lotus branded products at IBM’s Dublin Software Lab. Google Groups is a great way to foster communication over email and on the web, connecting people and allowing them to participate in and read archived discussions. Today, we are introducing the Google Groups Service in Google Apps Script. Groups Service will allow a script to check if a user belongs to a certain group, or to enumerate the members of a particular group. The Google Groups Service works with groups created through the Google Groups web interface as well as groups created by enterprise customers with their own domain using the control panel and the Google Apps Provisioning API. Silvano Luciani joined Google's London office in 2011 to make the AdSense API developers happier people. Before that, he has worked in Finland, Italy, Spain and the UK, writing web based configuration management tools for ISPs, social networks, web based training materials, e-commerce apps and more. He has recently discovered that he loves charts, and has finally started to play the drums in the London’s office music room. If you can call what he does "playing the drums". to automate their management activities or to integrate with third-party applications, including the Provisioning API to manage user accounts and groups, the Admin Audit API, Admin Settings API, and the Reporting API. These APIs were only available in Google Apps for Business, Education and ISP editions but many administrators of the free version of Google Apps also requested access to them. I’m glad to say that we listened to your feedback and, starting today, we made the these APIs available to all Google Apps editions. Please check the documentation as the starting point to explore the possibilities of the APIs and post on our forum if you have questions or comments. Google Apps domain administrators have access to a number of APIs to automate their management activities or to integrate with third-party applications, including the Provisioning API to manage user accounts and groups, the Admin Audit API, Admin Settings API, and the Reporting API.
. A number of developers in the forum have asked what to do when certain requests cause errors, and this documentation responds to their general need for better information. This new documentation details all errors and the scenarios that cause them. We strongly recommend that both new and advanced Google Documents List API developers read the section thoroughly. An important technique described in the new docs is exponential backoff. Exponential backoff helps clients to automatically retry requests that fail for intermittent reasons. For example, an application might make too many requests to the API in a short period of time, resulting in HTTP 503 responses. In cases like this, it makes sense for API clients to automatically retry the requests until they succeed. client: gdata.docs.client.DocsClient authorized for a user. gdata.docs.data.ResourceFeed representing Resources found in request. We strongly recommend developers take about 30 minutes and update applications to use exponential backoff. For help doing this, please read the documentation and post in the forum if you have any questions. We have recently added a new section to the Google Documents List API documentation, titled Handling API errors. A number of developers in the forum have asked what to do when certain requests cause errors, and this documentation responds to their general need for better information. All major outages or issues, although infrequent, are announced on the Google Apps APIs Downtime Notify list as quickly as possible. We also post updates and resolutions. All developers using the Google Apps APIs should subscribe. 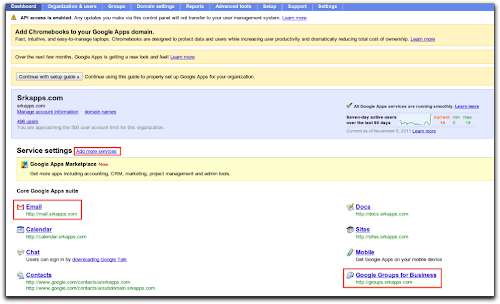 Announcements about new APIs and features as well as best practices about the Google Apps APIs occur on the this blog. You can subscribe via e-mail (see right sidebar), using the feed, by following @GoogleAppsDev on Twitter, or by following members of the team on Google+. If you want to hear about just the most important announcements, follow the Google Apps APIs Announcements forum. This is a low-volume list and you can subscribe via e-mail. Lastly, you should subscribe to the individual forums for the Google Apps APIs you care about the most. A lot of technical discussion occurs in the forums and many advanced API users participate in the conversation along with Google engineers. Developers using the Google Apps APIs owe it to themselves to stay informed. To make it as easy as possible, we’ve adopted a standard process for making important announcements about the APIs.
. In addition to the advantages it gains from Google's new infrastructure for APIs, Google Calendar API v3 has a number of improvements that are specific to Google Calendar. In this blog post we’ll highlight a topic that often causes confusion for developers using the Google Calendar API: recurring events. A recurring event is a 'template' for a series of events that usually happen with some regularity, for example daily or bi-weekly. To create a recurring event, the client specifies the first instance of the event and includes one or more rules that describe when future events should occur. 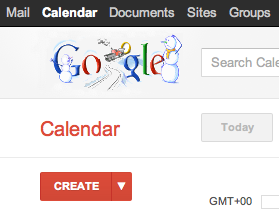 Google Calendar will then 'expand' the event into the specified occurrences. Individual events in a series may be changed, or even deleted. Such events become exceptions: they are still part of the series, but changes are preserved even if the recurring event itself is updated. When added to a calendar, this will turn into five different events. The recurrence rule is specified according to the iCalendar format (see RFC 5545). Note, however, that, in contrast to the previous versions of the Google Calendar API, the start and end times are specified the same way as for single instance events, and not with iCalendar syntax. Further, note that a timezone identifier for both the start and end time is always required for recurring events, so that expansion happens correctly if part of a series occurs during daylight savings time. By default, when listing events on a calendar, recurring events and all exceptions (including canceled events) are returned. To avoid having to expand recurring events, a client can set the singleEvents query parameter to true, like in the previous versions of the API. Doing so excludes the recurring events, but includes all expanded instances. Now, we could turn one instance into an exception by updating that event on the server. For example, we could move one meeting in the series to one hour later as usual and change the title. The original start date in the event is kept, and serves as an identifier of the instance within the series. This would return a collection with either zero or one item, depending on whether the instance with the exact original start date exists. If it does, just update or delete the event as above. We hope you’ll find value in these changes to recurring events. Keep in mind, too, that these are not the only improvements in Google Calendar API v3. Look for an upcoming post describing best practices for another key area of improvement: reminders. If you have any questions about handling recurring events or other features of the new Calendar API, post them on the Calendar API forum. Editor's note:: 2/20/2012 - Removed references to API call which reverted changes made to an individual instance. This feature was deprecated. Peter joined Google in 2006. He's been leading the Calendar API team for the last 2 years. He's previously worked on video uploads for YouTube. Fabian is a Software Engineer at Google in Zürich, working on Calendar and Tasks, with a focus on APIs. We recently launched a new version of the Google Calendar API. In addition to the advantages it gains from Google's new infrastructure for APIs, Google Calendar API v3 has a number of improvements that are specific to Google Calendar. In this blog post we’ll highlight a topic that often causes confusion for developers using the Google Calendar API: recurring events. , and announce them on @GoogleAppsDev and our personal Google+ profiles. Hope you’ll hang out with us soon! Ryan is a Developer Advocate on the Google Apps team, helping businesses build applications integrated with Google Apps. Wearing both engineering and business development hats, you'll find Ryan writing code and helping businesses get to market with integrated features. We've held many Office Hours on Google+ Hangouts over the last two months, bringing together Google Apps developers from around the world along with Googlers to discuss the Apps APIs. We've heard great feedback about these Office Hours from participants, so we've scheduled a few more in 2011. As we add more Office Hours in the new year, we'll post them on the events calendar, and announce them on @GoogleAppsDev and our personal Google+ profiles.